Tags: Amazon, audio book, Book, Crash Course, e-book, Prosper, Prosper! Big news!! Our new book has arrived! You talk about the price of everything and the value of nothing. Well it is clear to see without reading the book yet that this book will be incredibly valuable to me (especially relative to the price). Thank you to everyone who put time and energy into it. I can't tell you how grateful I am for this community and the efforts put in to try and make this world better. I'm looking forward to using this guide to be more resilient. Thank you Chris and Adam! I can't wait to read/hear "Prosper! "; truly worthy of "good news Friday"! Congrats also on the excellent "promo" statements; well done! PS I initially tried ordering a copy of the book using Paypal, but seemed to get stuck in an infinite loop. After I hit "Review", it came back with the "Review" button at the bottom again (vs the "Submit" button). So I was never able to submit the order that way. But then I switched to using a credit card, and that worked fine. Many thanks for letting us know. You're the second person tonight to report wonkiness trying to purchase the book via PayPal. I've flagged the issue for our IT team. I'm hoping they can leap on it tomorrow, but given that it's Friday night on a holiday weekend, it may not get resolved until Monday. Whenever it's fixed, I'll let folks know here. And for anyone wondering: using a credit card works just fine when purchasing the book. will the audiobook be available on audible.com or just in CD form? Ordered and can't wait to read it! 2. Order through PP, further support Chris and Adam, but... get hit with $19 + $5 shipping. FYI, I saw this post today and just tried to order via paypal to no avail. Purchased via CC instead. Congratulations Adam and Chris! I look forward to reading the book and writing a review. I encourage everyone who reads the book to review it on Amazon and Goodreads. As mentioned above, we'll ship all pre-ordered books by Nov 17th, the day the book becomes publicly available. We're still awaiting our bulk shipment from the publisher. If it arrives soon, though, we'll start shipping books out before the 17th. As mentioned, our plan has been to start shipping out pre-ordered books tomorrow. Frustratingly, our bulk shipment has not arrived yet. The distributor tells us it should be arriving any day now. Our apologies for what is looking like a short wait. I will post here the moment the books arrive. We will ship all pre-ordered books in the two days following then. Argh. I hate to report this, but our bulk shipment of print books from the publisher still has not arrived yet. They are now promising delivery by Tuesday. Suffice it to say, it has been a frustrating several days waiting for this delivery. We have been pushing our publisher every day for expedition. I will announce here when the delivery arrives, and we'll start shipping books out to those who have pre-ordered the moment it does. As for the audio version, the final files we're delivered to Audible.com on Thursday. We are now waiting for Audible to post it live on their site. I'm checking by the hour and will announce here when its available. I can't speak for anyone else, but it is pretty obvious the delay is out of your and Chris's control. I was happy to get a chance to read the free chapter you posted; thanks for doing that! And I look forward reading the rest of it! I just checked Audible. Nothing for Prosper yet. Print books: I spoke yesterday with the trucking company delivering our books. They experienced a weather delay over the weekend. Given that, plus the Thanksgiving holiday, they're now quoting delivery of our bulk shipment by Friday. We will start mailing the books out to all who pre-ordered as soon as the books arrive. Audible.com: as mentioned, the files were delivered to Audible last Thursday. At this point, it's out of our publisher's hands. We are simply waiting for Audible to add the audio book to its catalog and offer the download. Audible.com is part of Amazon: a massive Borg ship that moves only at its own whim. We are now reduced to simply waiting -- and I am checking hourly. Suffice it to say that these (and other) delays with the general availability of our book have been increasingly infuriating as the official launch date of Nov 17 moves further into the past. I have spent the vast majority of each day since pushing our publisher and related parties to expedite and resolve -- but being frank, I'm getting a crash course in why the publishing industry is dying. It's a tangled nightmare with cartel-like racketeering, unnecessary middlemen, and deliberate/moronic lack of transparency. But despite all that, we are confident and committed that everyone who orders a book will receive it. And it does seem like the remaining issues will be resolved within days, at most. Don't stress out. It isn't good for your health. C'mon audible! I want to pick up the audio version (already bought the e-book) while I have a captive audience in the car this Thanksgiving. I figured people here would want to know about that too. Looking forward to it, Chris and Adam! Maybe it's been mentioned somewhere here on Peak Prosperity but I haven't seen it. Chris and Adam are the guests on the most recent KunstlerCast podcast, talking about "Prosper". It was a great discussion making me want to get my copy all the more. It sounds like an excellent book with significant potential to be life changing. Thanks for the updates, Adam, on the status of delivery for the preorders. While I'm excited to get my copy I'm not going to stress about it. In the overall scheme of things it should arrive soon enough. This brings back memories of 4 years ago when my mind had been blown by reading The Crash Course for the first time, then again from cover to cover twice more. I purchased 17 copies of The Crash Course for all of my relatives for Christmas presents that year. I hadn't been aware that Chris and Adam were on the KunstlerCast discussing "Prosper! ", and look forward to checking it out! The truck just dropped these off. I managed to get the first few boxes to the UPS Store before it closed (half-day). I'll drop the rest off when it opens in the morning. Many thanks for the patience of all of you who pre-ordered. The books will be shipped over the next 2 business days. As your packaged is shipped, you should receive a UPS confirmation email with a tracking number. You look like a happy camper now! could you put the table of contents online? could you please put the table of contents online? I couldn’t find it on the websites of online shops. It would help me to see whether (respectively to which degree) the content is specific to people living in the USA. In our opinion, just about all of the book's advice is relevant to everyone, regardless of country of residence. How did you get a palet with hundreds of pounds worth of books into your kitchen? That photo is a fake! Just kidding, but that is a lot of books you are sitting on. Happy shipping! I suppose a table-saw also does not really "fit the bill" of typical kitchen either. That's pretty smart to use old kitchen cabinets in a garage. Nice. We are still awaiting posting to Audible.com & iTunes. Should be any time now -- will post here as soon as it appears there. Audible manages iTunes' audio book catalog, so Prosper! should be live there, too, within the next few hours. I had ordered a copy of "Prosper!" on CD to listen to, but discovered that the CDs were not coming out until January 2016. So I decided to check out the version on Audible.com. Somehow in this process, I was able to get a free trial subscription to Audible. And using that free trial subscription, I have been able to get free access to listen to “Prosper!”. Unfortunately, this was several days ago, and I did not write down the steps I’d taken that (inadvertently) got me the free subscription. But I think it may have either been by (1) going to Amazon.com, looking up “Prosper!”, and clicking on the “Audible” version (and then getting notified of the opportunity to sign up for a free trial subscription), or by (2) going directly to Audible.com and looking up “Prosper!”. I am hoping that someone here will be able to figure out and repeat what I did, and then share the steps they took to do it with others here. I was originally offered an Audible trial subscription for 2 months, which then got bumped to 3 months (I think because I’m a member of Amazon Prime). The way the Audible.com trial subscription works is that you get to access one book per month, until your trial subscription ends. You also have to give them a credit card number; then, if you don’t cancel your trial subscription by (before?) it ends, you’ll start getting billed the monthly subscription rate. Also note that you will need an app that allows you to listen to Audible books. They list what your options are on Audible.com. If you don’t have the app (and I didn’t), you can get instructions for downloading a free app that will then allow you to listen to Audible books. That worked for me. BBC seeking forming communities - Documentary - $$available!! I just received an email, forwarded thru The School of Living list-serve, from the FIC. This post server won't accept clip n paste from my email, but a summary is that BBC wants to do a year-long documentary on the life of groups forming new Off Grid Intentional Communities - & they appear willing to PROVIDE THE LAND! This is NOT to be scripted! pure documentary! They want to complete sign-up in the next two weeks. I can forward the announcement and application to anyone interested. I trust the FIC people to have vetted this as real. I just finished reading Prosper! The book was excellent. Thank you for writing it. I posted a review on Amazon and Goodreads. I hope other readers do the same. It is very helpful to provide social proof. Many thanks for the kind words and for posting a review. Yes: we're hearing loud & clear from our publisher that customer reviews indeed have a substantial amount of influence -- both in terms of influencing readers as well as trade buyers. For all reading this: if you've read Prosper! and have feedback to share, please post it on Amazon (or your favorite book retailer's site) today! David Morgan interview points to Chris and Adam & "Prosper!" I was surprised and pleased when he said that Chris and Adam were going to be featured in an upcoming solutions conference in Las Vegas in February, and held up a copy of "Prosper!" Starts at ~26:02 min. Nice promo Chris and Adam!! 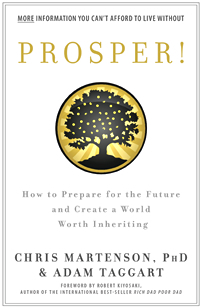 My pre-ordered book (Prosper!) hasn't been received, nor an explanation given as to when it might be sent; I do hope this doesn’t reflect upon the books content. Come on guys, you can at least inform me as to when I might receive this gem; I’m making decisions based upon the books input, and would hate to screw up because I didn’t get the book in time. Help me out here! They ring true. I've seen people close to me get through some pretty tough time using various combinations of these characteristics.